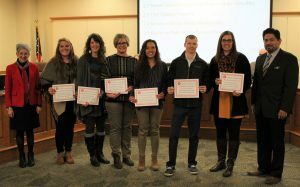 Last night the School Board recognized teachers for their students’ achievement. Assistant Superintendent Tamra Ummel introduced the teachers whose students earned the highest achievement and growth scores according to the Indiana Department of Education testing reports. Todd Williams, Math teacher at GMS last year, Master Teacher at Chamberlain this year. Kelly Shoup Hill, English teacher at GMS. Molly Kaufman, a 6th grade teacher at GMS. Sarah M. Yoder, 4th grade teacher at Waterford. Carrie Markham, 5th grade teacher at West Goshen. Courtney Drake, taught 4th grade at West Goshen last year.